Chris Burkard does some real world testing of the Sony a6000, as part of DP reviews video series. I’m going to try and build out the items in this list into full posts to come up with some tips and strategies for making the most of the a6000 for surf photography in future posts, starting with some examples shot this week with my Sigma 60mm f2.8 in shutter priority mode. Obviously Chris is a Sony Global Imaging Ambassador, so it would of been pretty unlikely for him to pick out too may faults with the camera, but it doesn’t feel too much like a Sony advert and there’s some good insights into being a (surf) photographer too, I’ll leave you to find those out by watching the video yourself. Most of the video was shot on a Sony A7S by the way, check out this fact and many, many other opinions on the camera and the video in the nearly always dull and repetitive DpReview comments section. Hey Ben, could you possibly include the focus modes and metering mode you use with your a6000 in your upcoming post. Im interested in what to use with my NEX 5r and how it compares. Oh and that last sentence made me chuckle, DPR comments and forums are the worst I’ve seen. All threads just end up turning into some type of argument and completely off topic. I will make sure I include those details, I’ll also try them out on my 5R to find the equivalent settings if they’re different. DPR members are right up there with Stabmag commentors, I always get sucked in and spend 5 minutes reading the same silly comments before giving up. Would you suggest an a5000 would be a good cheaper alternative to the a6000 as someone who wants good gear but is just starting so doesn’t want to spend too much. Also do you know if the housing would fit the a5000? It looks to be the same size as the 6. 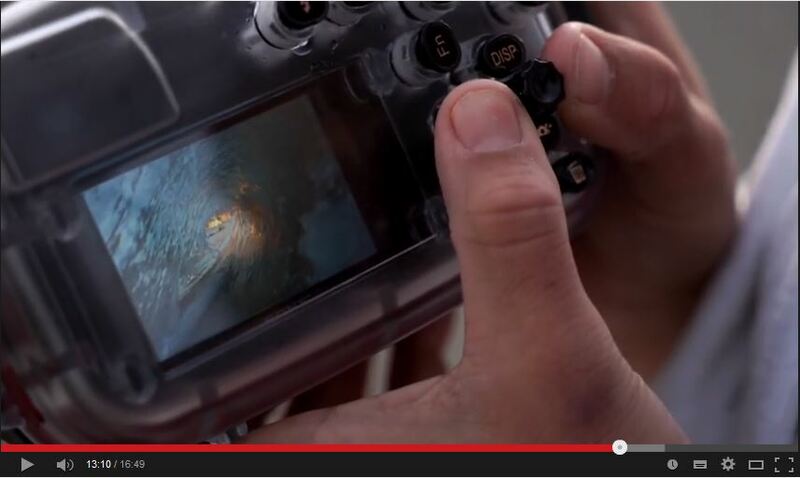 1: The viewfinder – in my new surf housings for the a6000 I only use the viewfinder, never the LCD screen. it’s hard to use the LCD screen in bright light, you’d need some sort of loupe style eye piece to use it properly which is impractical in the surf (I’ve tried it). 2: The burst rate – it’s 3.5 shots per second, which is a bit slow for lots of types of surf photos. A wave breaks so fast that you don’t get much chance to capture the best moment, so the higher burst rate the better. The lenses you buy are just as important, or even more important, than the camera body, because a good lens is likely to last much longer than a camera body, and it will hold it’s value better too. So don’t forget to factor the lenses into your budget too. Overall it would do the job for sure and you could definitely get some good photos with it, but you might find the lack of viewfinder a bit of a challenge for surf photography. I am currently looking at some second hand a6000’s. No problem, I’m sure you’ll enjoy whichever one you end up with. I’ll be sure to share some of my photos with you when i do. Hi Ben one more question dude. You recommend not using the Meikon dive housing if possible, I’m just wondering why that is? I can understand you get what you pay for etc but practically are there any things about a dive housing that impede on photo quality or is it just a weight and buttons and grips issue. As I’m starting out I would like to go for the cheaper dive housing rather than the surfs you recommend but I also want the best quality images. Fixed port – you can only use the kit lens and other short prime lenses like the Sigma 19mm and 30mm. You can’t shoot with a fisheye or bigger prime lens. No viewfinder – although you can polish the frosted plastic so it’s clear. No pistol grip – it’s much harder to shoot surf photos when you have to hold the housing in two hands all the time. So if you only want to use the kit lens and short primes, and you don’t mind holding it in two hands when shooting then it’s a good option. It’s a good option to get started but once you’ve used a surf housing you’ll never want to go back to a dive housing. In terms of image quality it will be the same as any other housing pretty much. you’ve just got less lens options and it’ not as easy to handle. Ben! I got the Sony A6000 for “in the water” surf photography per your recommendation. I grabbed the Meikon housing just to start out (will probably go Salty later). I am having trouble getting the camera to focus on the surfer (and not the water in front of the surfer!) Help! I’d try using the center focus point and experimenting with the lock on focus modes. If you can focus with the surfer right in the middle of the frame, then track them throughout the ride it should help. All the other settings look good. What’s the benefit of using the back button focus ? I don’t get it. When you separate focus from the shutter you can selectively stop focusing whist still taking photos. It means you can stop focusing when something gets in the way in the foreground, like another person or a bit of wave, and keep the focus at the correct distance for the wave or surfer. It also helps if you’re shooting with an autofocus fisheye, you can focus for above water, take your shots without touching the focus again and be sure they’re all correctly focused, until you need to shoot underwater, when you use back button focus to autofocus underwater. It’s not always a huge advantage, but many action photographers like to use it, and Aquatech have had separate focus and shutter buttons on their pistol grips for a few years now, so many pros must like it that way I guess.